Six in the morning in Kourou: outside it is still dark, but the thermometers are already reading 24 degrees Celsius, and the relative humidity has remained 92% through the night. After sunrise at 06:18 today, the temperature will climb to reach a maximum of 34 degrees in the afternoon. 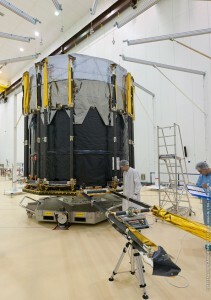 The Gaia spacecraft, however, is inside the cleanroom, where the temperature is maintained at a constant 23 degrees. Air is circulated through filters to preserve a clean environment, and the humidity in the cleanroom will be kept at about 50%. 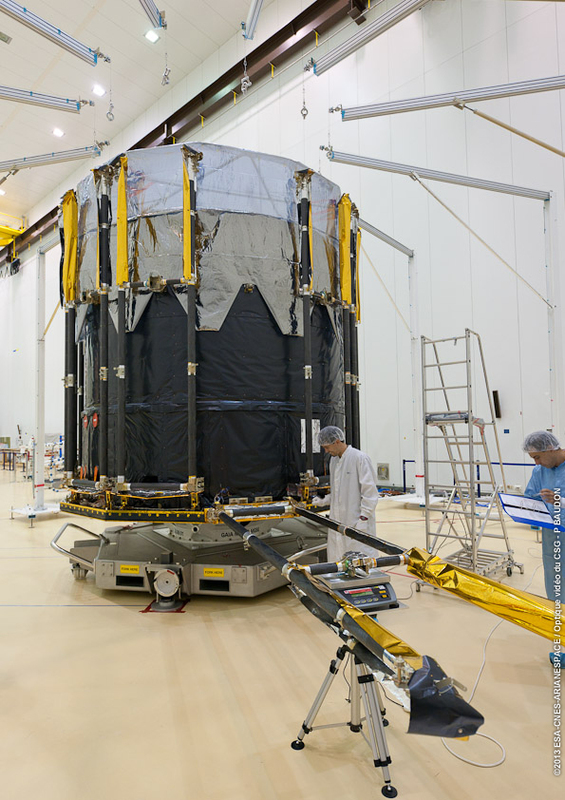 In the airlock leading to the cleanroom, the Astrium Assembly, Integration and Testing (AIT) team and the SENER Sunshield team are getting ready to start the first shift of the day. The Astrium AIT team has the delicate task of putting together all the elements that make up the spacecraft. The sunshield is one of the very last parts to be added to the spacecraft, and for that phase they work together with the SENER team. The structural skeleton of the sunshield is made up of 12 frames of carbon fibre tubes, split into 4 quarters of 3 frames each. Each quarter has to be lifted with an overhead crane from its transport frame, smoothly placed on the spacecraft, and carefully aligned before it is fastened in its final position. Each of the 12 frames is hinged at 2 points at its base, where it is attached to the spacecraft, and can be deployed 90 degrees. When all the frames are deployed and thermal blankets are added to cover the structural skeleton, the sunshield will form a flat disc at the base of the spacecraft, which will shade the Gaia telescope from the Sun. 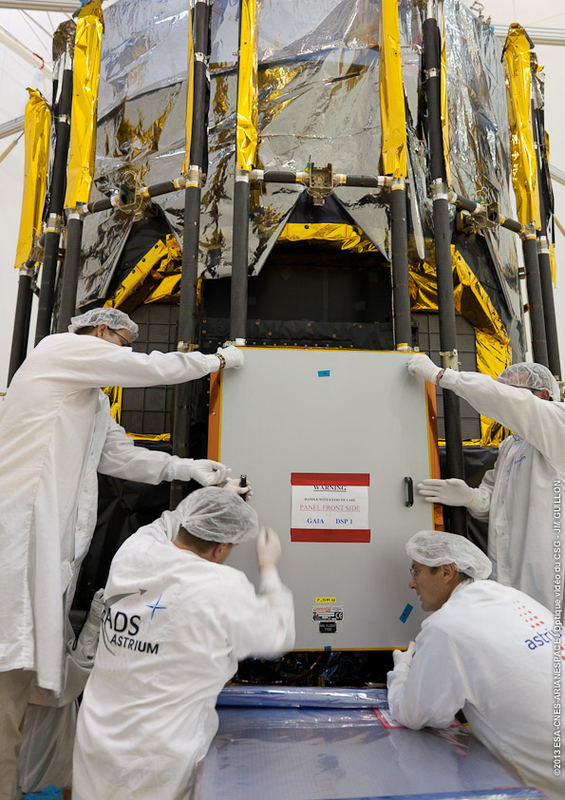 Before adding the thermal blankets, the frames are deployed one by one, and a laser tracker is used to measure the position of several points on each frame to check that once deployed they will all form a perfectly flat plane. Stiff torsion springs are later added to connect each frame with the two adjacent ones, so that all 12 frames will deploy simultaneously. 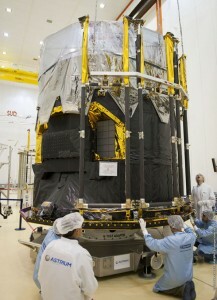 In addition to shading the telescope from the Sun, the sunshield also carries some of the solar array panels that will provide the energy to power all the electronics on board the spacecraft, which include the data processing computers, as well as the communications, navigation, and thermal control systems. 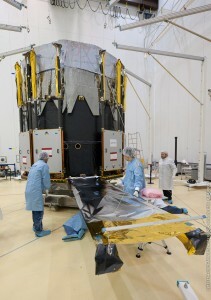 The solar arrays on the Gaia spacecraft will provide approximately 1850 Watts of electrical power. At home, 1850 Watts would allow you to prepare dinner in an electric oven, or maybe use a vacuum cleaner. In outer space, that is enough to keep all of Gaia’s electrical systems running, enabling us to glimpse into the depths of our Galaxy. In its final position in space Gaia will be at approximately 150 million kilometres from the Sun. At this distance from our star, 13 square metres of solar cell, is enough to provide those 1850 Watts. The further a spacecraft travels from the Sun, the larger area of solar panels is required to produce the same power. For example, when the first of the twin Voyager spacecraft launched in 1977 and flew by Jupiter, it would have needed solar panels 25 times larger than those of Gaia to produce the same power that we will have in Gaia, and 80 times larger when it reached Saturn. For this reason, instead of carrying solar arrays, Voyager relies on Radioisotope Thermoelectric Generators (RTGs) to generate its electrical power. Voyager 1 is now the first human-made object to leave the Solar System. Travelling into interstellar space, some 19,000 million kilometres from the Sun (or 125 times further from the Sun than the Gaia spacecraft will be), Voyager would now require solar panels more than 10000 times larger than those on Gaia to produce the same power! In the next blog entry we will tell you about the pyrotechnic nuts that allow the release of the frames, and about the final deployment test before the sunshield is stowed in its final configuration ready for the launch. Daniel Escolar, Gaia Mechanical Engineer, reporting from Kourou.